Landmarks rejected owner’s initial request to build five-story addition to 1990s structure. On June 1, 2010, Landmarks approved a revised proposal to construct a three-story addition on top of a three-story structure built on a triangular lot at 115 Seventh Avenue South in the Greenwich Village Historic District. The existing building, referred to as a “modern commercial building” by Landmarks, was completed in 1994 and is occupied by Gourmet Garage and a New York Sports Club. At a March 2009 public hearing, the owner initially presented a plan to build a five-story, glass-faced addition that would be set back from the streetwall. The owner’s representative, Frank Angelino, conceded that glass was not common in the district, but he argued it was an unobtrusive material. 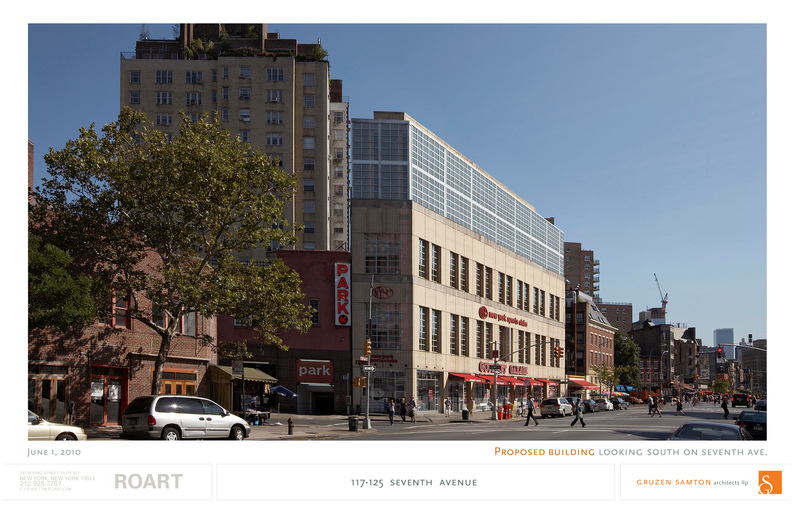 Manhattan Community Board 2, residents, and preservationists opposed the initial plan. The Historic District Council’s Nadezhda Williams said the project was “too shiny and glitzy” for the area. Chair Robert B. Tierney found the addition’s scale problematic, noting that it would not connect with the existing base. Other commissioners agreed, and Landmarks asked the owner to return with a revised proposal. On May 11, 2010, architect Peter Samton presented a revised proposal. The plan featured a two-story metal and glass addition with a stucco penthouse. Unlike the initial proposal, this addition would be flush with the existing facade, and only the penthouse would be set back. Samton explained that the existing building’s third floor glass facade would be reclad in brick to match the first two floors and the secondary facades would be clad in stucco. Commissioner Margery Perlmutter said the plan was inadequate for “such a prominent location,” and recommended that the side facades be further developed. Commissioner Stephen Byrns found the approach generally appropriate, but believed that the ratio of masonry to glass needed more work. Tierney asked the owner to return again with further refinements. At a third meeting, Samton presented a final proposal that included more masonry. The building’s secondary facades would now be reclad in brick and signage would be reduced. Landmarks reacted positively to the revisions and voted unanimously to approve the revised design. LPC: 115 Seventh Avenue South, Manhattan (09-2534) (June 1, 2010) (Architects: Gruzen Samton LLP).